On this day in 1554, Lady Jane Grey, the “Nine Day Queen,” was executed at the Tower of London. She had been chosen to succeed the throne by her cousin Edward VI, who died without issue at the age of 15. Her reign will go down as the shortest in British history. Fearing a return of Catholic ascendancy, Edward VI had made provisions to overlook his half-sister Mary, who was the rightful heir to the throne under the Third Succession Act of 1544. The act, conceived by Henry VIII, was designed to ensure that his daughters Mary and Elizabeth were recognised as heirs to the throne, their having been previously debarred from succession through grounds of illegitimacy. The chief player behind the decision to crown Lady Jane was her father-in-law John Dudley, Duke of Northumberland. He was Edward’s chief minister, and a persuasive influence on the dying King. Northumberland was vehemently opposed to the Catholic Mary taking the throne, and had a vested interest in seeing his Protestant daughter-in-law crowned instead. He encouraged the King to bypass Mary’s right to accession and name Lady Grey, a direct descendant of Henry VII, as his successor. The sickly Edward finally succumbed on 6 July 1553, and four days later Lady Jane was proclaimed Queen. However, from the outset her succession proved controversial and Lady Grey’s reign appeared doomed to failure. Mary, seeing herself as the rightful heir, was furious at having been denied the crown, and determined to overturn the decision. She enjoyed widespread support, and within a few days of Jane’s appointment mustered an army capable of seizing power. Faced with armed conflict, support for Northumberland and Jane quickly dissipated, and more and more noblemen allied themselves with the defiant Mary. Even Jane’s own father, the Duke of Suffolk, voiced his support for the usurped Mary, and it was he who persuaded Jane to relinquish the crown. Mary was pronounced Queen on 19 July 1553, just nine days after Jane had assumed the position. Jane and Northumberland were arrested and charged with high treason, along with their most prominent supporters. Both were sentenced to death, but in a spirit of leniency, were not immediately executed, and instead imprisoned in the Tower of London. They may well have escaped execution if it were not for the Protestant Rebellion of January 1554. The rebellion was quickly suppressed, but Mary, fearing the captive Jane might become a figurehead for the anti-Catholics, decided it was expedient to carry out the suspended sentences. As a mark of respect, Jane was given a private execution, and on 12 February was taken to Tower Green and beheaded. Mary Tudor’s reign saw the brief restoration of Roman Catholicism. This came to an end in 1558, when Mary died without issue. The Crown then passed to her sister Elizabeth I, who reestablished Protestantism as the religion of state. 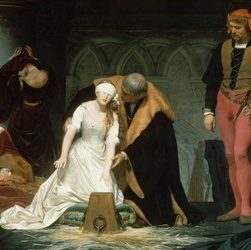 Photo Caption: “The Execution of Lady Jane Grey” by Hippolyte Delaroche, 1833.